At select workshops, residents can purchase compost bins at a discount. Cash or check only. Limit 2 bins per household. Subject to availability. Arrangements could be made if supplies run out. Worm bins include African Red Worms (Eisenia fetida), also known as Red Wigglers, which are the most common type of composting worm. They process large amounts of organic matter (up to half their body weight per day), reproduce rapidly, and are very tolerant of variations in soil conditions. As nature's soil aerators, worms improve and condition the soil as they burrow in search of food. Composting worms excrete a valuable natural fertilizer (called castings), which contain 5 times the nitrogen, 7 times the phosphorus, 3 times the magnesium, 11 times the potash, and 1.5 times the calcium as are normally found in 6 inches of top soil. Other names for Red Wigglers include Tiger worms, Garlic worms, Manure worms, and Brandling worms. Backyard composting bins are sold at select workshops for $40 each. Limit two bins per household. Cash or check only. 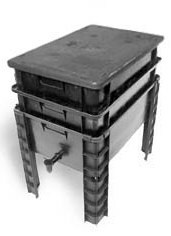 Worm composting bins are sold at select workshops for $65 each and includes 1/2 lb of worms. Limit two bins per household. Cash or check only. Price is subject to change.